Home battery energy storage is on track to become commonplace in Australia by the end of the decade, just as rooftop solar power is now. The industry is still young, however, and there are a lot of knowledge gaps to be filled in on the topic for households and solar installers alike. One of the crucial questions to ask is ‘What comprises an energy storage system?’ Understanding this will help installers and households to make a more well-informed decision about what type of products are most appropriate to a given household’s circumstances. To get to the bottom of this question, Solar Choice recently caught up with Dane Muldoon, sales engineer for solar & energy storage wholesaler Supply Partners – who deal in a wide range of solar panels, inverters, batteries and other devices. Our conversation helped us to shed light on the various approaches to grid-connected energy storage and the advantages and disadvantages of each. Q: What are the basic components that make up a residential battery storage system? There’s a great deal of interest in residential battery storage as a way of extending the reach of solar power into the evening by storing excess solar generation during the middle of the day and discharging that energy after sunset. This type of battery storage system is referred to as a “self use” system as it helps the home owner use more of their self generated solar energy. In the self use model the basic components of the system are a solar power array, a battery bank, and inverter equipment for converting the direct current DC electricity supplied by the solar and the batteries into regular AC electricity for use in the home. Most of the diversity in this emerging market is in the inverter space. Q: There are a lot of energy storage products out there – some of them are complete systems, while others are not. What’s an easy way to classify these various products? Traditional Off-grid manufacturers: there has been an off-grid solar industry in Australia for a long time serving remote communities and people for whom getting grid connected was simply too expensive. In fact my father was installing off-grid solar power systems in Northern NSW in the mid 1980s! It’s no surprise that the inverter manufacturers with the most knowledge of battery systems are those that have been servicing the off-grid market for many years like Schneider Electric, SMA and Selectronic. These manufacturers have now taken steps to ensure that their battery inverters can also work on-grid. 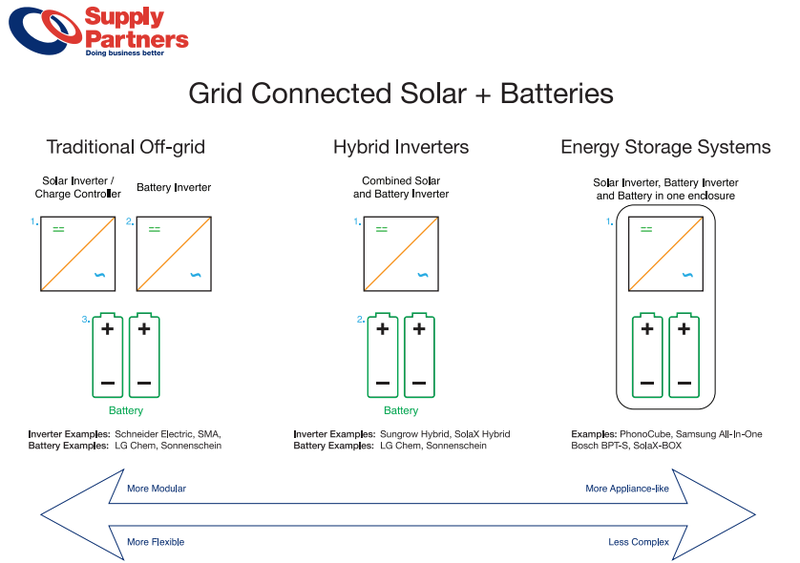 In a typical configuration there’s three major components beyond the solar array – a battery inverter, a separate solar inverter and the battery bank. As they take advantage of modular components, a battery inverter and batteries can be retrofitted to an existing solar system. Hybrid Inverters: inverter manufacturers that have only ever offered grid connected solar inverters have been closely watching the rising level of interest in the community for solar + battery solutions and have recently started to enter the market. So far the preferred approach from these manufacturers has been to essentially add battery management capabilities to their existing solar inverter platform, which has created a new class of inverter product: the hybrid Inverter. Unlike the traditional off-grid approach there is just one inverter in the systems that combines the solar and battery functions. As they incorporate the solar and battery management functions into a single enclosure they’re not suitable as a retrofit option for existing solar customers unless the existing solar inverter is replaced. Energy Storage Systems: some inverter and some battery manufacturers have taken an even more “appliance like” approach to the on-grid solar + battery market but combining all of the major components bar the solar array into a single enclosure including the solar inverter, the battery inverter/charger and the batteries themselves. These Energy Storage System (ESS) products from manufacturers like Samsung, Bosch, SolaX and Phono Solar are designed to simplify product selection for the buyer, offer ease of installation to the installer and peace of mind to the owner with a single manufacturer handling all warranty and service inquiries. As they incorporate all components into a single enclosure, they’re not suitable as a retrofit option for existing solar customers unless the existing solar inverter is replaced. Q: What are the respective advantages of the products in each of these categories? While products in each of these three categories will happily store excess solar power produced during the day for use in the evening, each has their pros and cons. Traditional Off-grid manufacturers: by using essentially off-grid components that have been tried and tested in some of the harshest central Australian environments, products in this category are rock solid in their reliability and highly configurable. There are many components to choose from and they can be mixed and matched in a myriad of different ways to suit absolutely any customer requirement. Blackouts are obviously not a problem for equipment designed to work independently of the grid and optional accessories even allow for the integration of backup generators. But the modularity and flexibility comes at a price with the overall cost of installing separate solar and battery inverters meaning that these systems are more expensive and complex than others. Hybrid Inverters: by focusing exclusively on the grid-connected market hybrid inverter manufacturers have managed to drop off-grid specific features to reduce price and complexity. With both the solar and battery management systems being combined into a single enclosure installation is easier and the installation space requirements are also reduced. A degree of flexibility is still retained in that the customer can largely choose which batteries they want to use including lead acid sets and some new lithium options from manufacturers like LG Chem. Not everyone will be happy with hybrid inverters’ blackout performance though – some models do not offer Emergency Power System (EPS) capabilities at all. Energy Storage Systems: by combining the solar and battery management systems as well as the batteries themselves into a single enclosure, ESS units offer maximum simplicity but minimum flexibility to the customer. Some ESS products on the market are offered in just a single configuration meaning that they’re fantastic for customers for whom the product meets their specific requirements but probably not suitable for the rest. 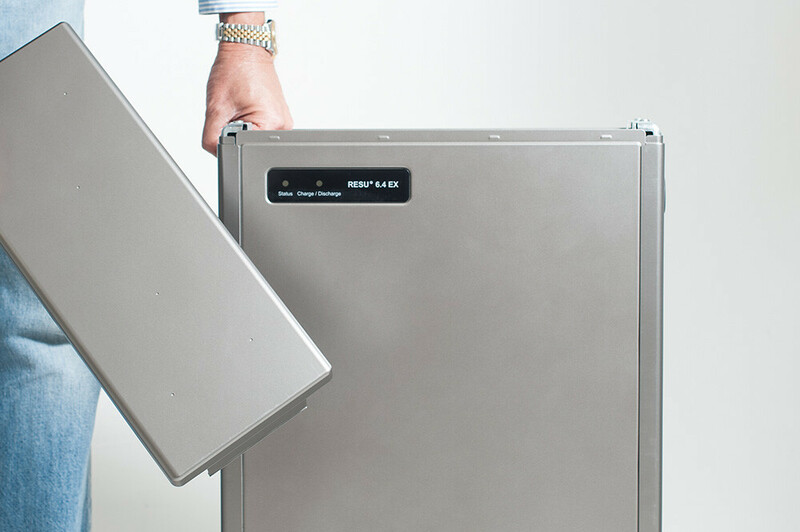 ESS units are generally designed to something like a cross between a fridge and a computer server cabinet meaning that the customer will need to find a suitable indoor location for install. ESS products are particularly forward looking in terms of opting for lithium batteries, which reduce size and weight and increase the product’s life expectancy. LG Chem’s RESU battery storage unit. Q: What certifications should shoppers and installers look for in a battery storage system? Like with many new technologies, the introduction of updated standards is currently lagging behind new products coming onto the market. This means that it’s more difficult for consumers to identify products that are certified to meet their requirements. Two things to look for though are 1) that the inverter(s) used in the system are compliant with the latest version of Australia’s AS4777 inverter standard (you can check for approved inverters here), and 2) that the installer has their battery installation accreditation. In the future there will be a hybrid system endorsement available to grid connect solar installers but currently only a full off-grid installation accreditation will suffice. 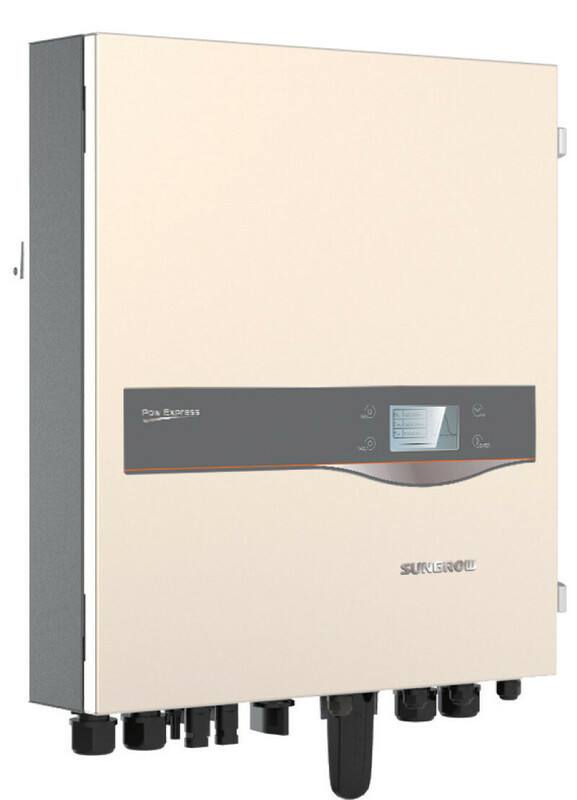 A battery-ready hybrid inverter from Sungrow. Q: What’s something related to battery storage that shoppers and installers should be aware of that is often overlooked or ignored? It’s key for customers to put some time into researching the battery management system / battery inverter that they intend to use (more than the solar panels or batteries). Grid connected battery management systems are the most complicated advancement in the residential/commercial energy sector we’ve seen since the advent of the grid connected solar inverter. This is a product that you want to be very particular about dealing with manufacturers with experience/quality and commitment to their product. Further, seek advice from experienced installation professionals in regards to design as one size does not fit all. There’s also definitely a lack of understanding among consumers and even some installers new to batteries around the topics of expected battery life and warranty coverage. With solar panels being renowned for offering 25 year warranties it can come as a surprise to customers that a lot of batteries can have a warranty as low as couple of years with possibly a few more offered at a prorated rate. This is where the manufacturer will cover just a portion of the battery capacity related to the age of the batteries at the time of claim. Over discharging batteries can greatly reduce their life expectancy so make sure you familiarise yourself with the expected cyclic life of the battery at the proposed depth of discharge level (how hard the battery is being worked). Battery manufacturers publish tables for each product that show how increasing the depth of discharge from say 30% to 50% can reduce the expected cyclic life by years. Try to avoid discharging lead acid batteries beyond 50% to maintain a reasonable life expectancy. Lithium batteries can usually be discharged far more aggressively to 80% or even 90% while maintaining high cyclic life but check the manufacturer’s own recommendations for discharge level. Be sure to ask for a warranty document for any batteries you’re considering. The fine print is important, as is the manufacturer’s ability to service warranties locally. Battery warranties often link expected life to ambient air temperature so keep this in mind when deciding where to position the batteries – a cool and completely weather proof location is best.